It's been three and a half years since the Harry Potter movie franchise came to a close with Harry Potter and the Deathly Hallows - Part 2, but fans are still clamoring for more stories set in this magical world. While a new spin-off trilogy is coming, with Fantastic Beasts and Where to Find Them set for release in 2016, that story will take place 70 years before young Potter first arrived at Hogwarts. Over the weekend, the Pottermore website revealed that author J.K. Rowling has written 12 new stories, with one story being unveiled every day between December 12 and December 23. 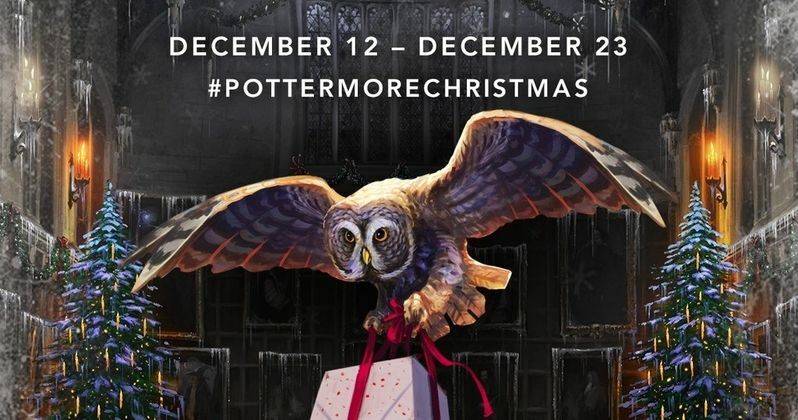 "Christmas is coming early to Pottermore. Starting Friday, December 12, we'll be releasing a surprise for you every day on Pottermore.com at 1pm GMT (8am EST). With wonderful new writing by J.K. Rowling in Moments from 'Half-Blood Prince', shiny gold Galleons and even a new potion or two, make sure you don't miss out. Just visit Pottermore.com and answer our rhyming riddles to unwrap a #PottermoreChristmas surprise every day." An email sent out to Pottermore members regarding the news offered a few more details, including stories about the nefarious Draco Malfoy and the Florean Fortescue's ghost plot. "From Florean Fortescue's ghost plot to J.K. Rowling's thoughts on the sneaky Slytherin Draco Malfoy, there's a wealth of writing to discover." Naturally, no further details are known about these stories, but the author's decision to highlight Draco Malfoy continues a Pottermore.com tradition where she sheds new light on various villains, with past stories including Rita Skeeter and Dolores Umbridge. Florean Fortescue's story may shed some new light on his death at the hands of Death Eaters in Harry Potter and the Half-Blood Prince. He owned an ice cream shop in Diagon Alley, and the author previously said she wanted to include a sub-plot that explained his disappearance, involving the Elder Wand, but it was cut from the book. Are you excited to read new Harry Potter over the holiday season? Chime in with your thoughts below, and you can CLICK HERE to invite your friends to Pottermore's Facebook event for these new stories.